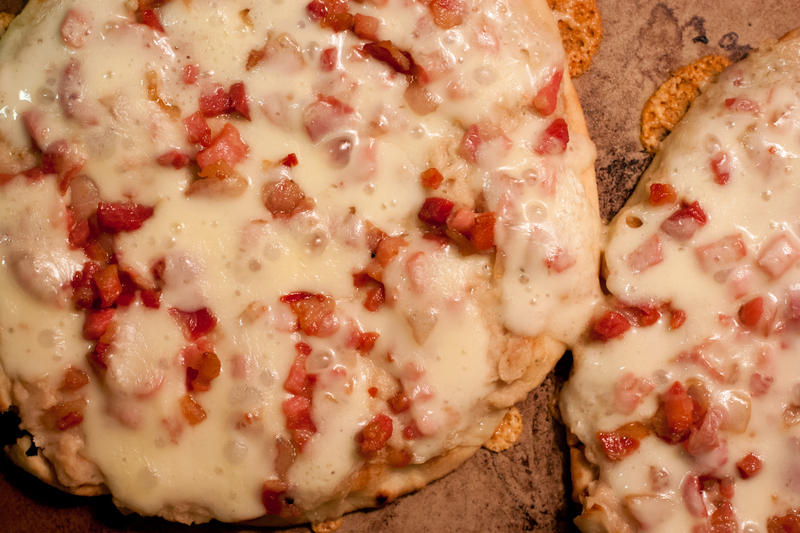 marlene b. creative: Pancetta Pizza. "I may not be awesome but I'm pretty freakin' fantastic." Yes, I am quoting myself from earlier this evening as I was making dinner. It all began while inventorying the refrigerator prior to grocery shopping. I had some unused pancetta left over from the amazing stuffing I made on Thanksgiving along with a random package of pizza crust mix in the cupboard. I searched online for a pancetta pizza and found a recipe for White Bean and Pancetta Pizza that included ingredients and flavors I enjoy. Preheat the oven with a pizza stone to 450°. In a skillet, cook the pancetta in 2 tablespoons of oil over moderate heat, until crisp; using a slotted spoon transfer to a paper towel-covered plate. While the pancetta is cooking mash the beans in a medium bowl, a potato masher works well. Add the garlic, rosemary and paprika to the leftover oil in the skillet and cook for a quick 20 seconds being careful not to burn the garlic, which is why I chop more than mince. Pour the garlic and oil mixture into the mashed beans and stir to blend. Brush the flatbreads with oil and spread with the bean mixture. Top with the pancetta and cheese. Bake the flatbreads until the cheese is bubbling, 5-7 minutes; transfer to plates, let cool a bit and serve. Food & Wine recommends a pairing with Chardonnay. I selected my favorite sparkling wine, Gloria Ferrer's Blanc de Blanc, which I have mentioned previously. One pizza is enough for a "healthy" appetite, whereas I had half tonight and saved the other half for work tomorrow. I foresee enviable comments in the break room. As for the availability of ingredients, I do not live in a metropolitan area was able to find everything at the two grocery stores in town, so no excuses! The flatbread comes two in a package and I bought two, leaving another set to experiment with later in the week. I love the protein-filled mashed beans as a "sauce" which is a great carrier for herbs and spices and allows endless vegetarian options. I would love to hear other ideas for variations because I have a feeling this will make regular rotation in my meal planning. I'm thinking sun-dried tomatoes, artichoke hearts and goat cheese!